That’s why Alex Mittendorf and Sean Crockett are today officially launching Cheerboo. The Palo Alto-based startup, a member of the nReduce incubator, is on a mission to build a better way for people to share and discover opinions online. While there are a number of networks one can turn to for insight into what friends, followers or photo-takers are doing and thinking, the founders want Cheerbo to be your go-to place to find out what the public thinks about — and what your friends think about — any topic, person, place, thing or idea. Essentially, they want to build and own the interest, or opinion, graph. Introducing many to Graph Theory in a social context for the first time in 2010, Facebook arguably has claimed ownership of the social graph, mapping our interpersonal relationships and using that data to power the social web. However, as these things go, Fred Wilson was probably right when he said that there probably won’t be “One Graph To Rule Them All.” Since 2010, social networks have continued to emerge, with a number of players now vying for control of each new graph, whether it be interest, health, taste or location. The social networks that have gained traction since have tended to be smaller social networks that serve niche audiences, like Pinterest, which combine the interest graph and the social graphs to let us follow our interests in a social context (i.e. through viewing content curated by our friends). Unsurprisingly, the importance of interest and taste graphs have grown for marketers, advertisers and developers, as they represent engines that provide more effective means by which to target ads (and improve their performance) and better ways to measure what people actually like. That’s what Cheerboo wants to harness. Of course, they’re hardly alone. TechCrunch has profiled a number of companies vying to build, solve and own the opinion graph, like Amen, Thumb, Menshn, Opinsy and Cheers to name a few. (And in reference to the latter, the founders were quick to point out that they bought their domain name and filed a trademark before Cheers launched, hoping to claim “Cheers” and “Boos” as actions used to express sentiment). However, while Cheers is only for the positive end of the spectrum, as is Facebook (no “dislike” button yet), Cheerboo wants to be the place you go to express your honest opinion, favorably or unfavorably, for any topic. 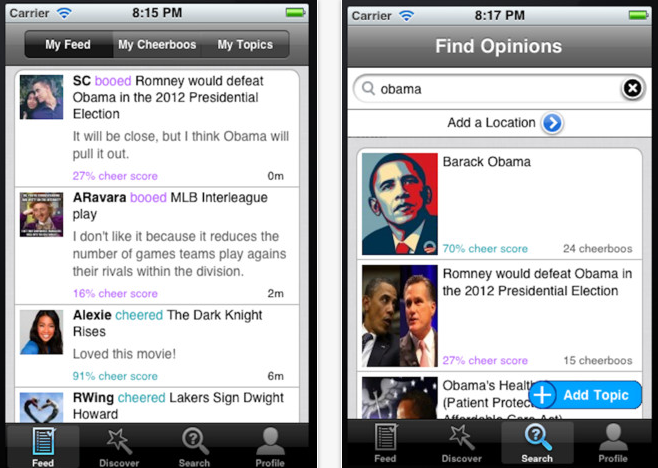 According to the founders, what differentiates Cheerboo from the rest is that the Facebook-powered platform (and iPhone app) combines a social feed, searchable topic pages and a single Rotten Tomatoes-style “Cheer Score” to let users quickly gauge public opinion on any topic. Users can up or down vote via Cheer or Boo buttons, elaborating on their opinion through in-line commenting. The idea is to give the Web one place to go to for viewing how the public feels about Mitt Romney, Barack Obama, bacon or the iPhone 5. Essentially, it’s a Klout score for everything. It’s an appealing idea and one that you could see being useful to brands (and individuals) from a CRM perspective, enabling them to quickly see how people feel about their business, products, performance, reaching out to users en masse or directly to ask questions, engaging them in conversation, etc. There’s also application for marketers, who could view user profiles/streams or tap into that data for a more three-dimensional look at people’s interests, how they feel about everything from ideas to new products. Cheerboo could also launch an API to let other applications and businesses tap into your opinion graphs to personalize your shopping, movie and television viewing experiences, and so on, or build a Cheerboo widget other sites could post to measure sentiment. There are a variety of potential applications for Cheerboo’s taste graph. Of course, these use cases have limited value until the startup is reaches scale, which is really the fundamental challenge for all networks like it. Facebook owns the social graph and powers the social web because it has more than one billion users. It’s also tougher to reach scale when a business relies on user generated content. Cheerboo could pull in users’ Facebook likes or +1s to give them a foundation of data from which to work and, to a degree, an automated way to create new topics and boost the aggregate sentiment available for each topic. However, as mentioned previously, Likes, +1s and their ilk only present positive sentiment and would naturally skew the site’s results in that direction. As one would expect, with the mind-boggling amount of data on our interactions, relationships, behavior and preferences created every day on social networks, many companies are eager to find better ways to mine this activity to determine how we feel about particular topics, brands, ideas, etc. Radian6 and others like it retroactively mine social data to determine sentiment, but they have to deal with natural language processing to do so. Given how difficult it is for some humans to decipher our tweets and status updates, these algorithms often come with a huge margin of error. Tellagence, a recently-launched Portland-based startup, believes it has developed a scientific/algorithmic approach which represent the next generation of social network sentiment analysis and can accurately predict the flow of content among other things. Aside from this technology taking a lot of time to develop, these companies tend to be B2B, enterprise or marketing/sales-focused and there isn’t a real leader here, even if there are solutions that boast real accuracy. And, of course, there’s Amplicate, which arguably already has scale and is way ahead in the game. Cheerboo, while it may not have data science developed for decades at MIT, is consumer-facing. It’s public and designed for the average user, not businesses. If it can scale, it will be one place for you to go for a quick look at how the masses (and your friends) feel about topical issues. Scaling, though, will be tough, as people are already starting to feel overwhelmed by the number of networks, making a frictionless, easy user experience key to getting over the hump. And the more it can work its way into other apps and sites through integrations and otherwise, the better. The startup hasn’t yet settled on a business model, but the founders said they’re considering multiple options, with the Twitter advertising model of promoted tweets (in this case opinions) among them. Right now, though, everything is free and the startup plans to go after some seed financing this winter. What do you think? Cheer or boo?